William A. Hawley, malaria project officer for UNICEF/Indonesia, will present the George B. Craig Jr. Memorial Lecture at 4 p.m. Sept. 14 (Wednesday) in Room 283 of the Galvin Life Science Center at the University of Notre Dame. Craig, a Notre Dame faculty member, was an internationally recognized expert on the biology and control of mosquitoes. After working on malaria for 14 years in Africa, including six years of residence in Kenya, Hawley has been working on malaria control and public health in Indonesia, the world’s largest and most biologically diverse tropical nation, for the past six and a half years. He has published regularly on mosquito ecology, genetics and behavior, and malaria epidemiology and control over the past several decades. Hawley’s professional career began as a Peace Corps volunteer teaching biology and mathematics in a Malaysian high school. This ignited a desire to make a living as a biologist and to spend at least part of his life working in the outdoors. 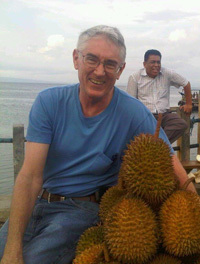 After leaving Malaysia, he was trained in field ecology by William Bradshaw at the University of Oregon and received postdoctoral training in mosquito biology in Craig’s Notre Dame laboratory. Craig, who died in 1995, spent his entire academic career at Notre Dame, joining the faculty in 1957 as an assistant professor and director of the Vector Biology Laboratory. He established a world-renowned research program in mosquito biology and genetics at the University, serving as advisor to 40 graduate students and 39 postdoctoral fellows, with whom he published more than 500 scientific papers. He also was a passionate teacher and mentor to countless undergraduate students. From the mid-1950s until 1975, Craig studied the genetics of Aedes aegypti, demonstrating the genetic basis of traits central to the understanding of disease transmission and mosquito control. Under his direction, Notre Dame-affiliated scientists carried out some 80 percent of all genetic research on Aedes aegypti. By the late 1960s, Craig and his associates began work in the reproductive physiology of mosquitoes, leading to discoveries that sexual receptivity in female mosquitoes is hormonally based and that the quantity of blood ingested by mosquitoes is determined by the neural system. After the arrival in the United States of the Asian Tiger mosquito (Aedes albopictus), Craig feared it as a more effective transmitter of disease than native species and expanded his research to include this new menace to public health. Craig was the first Notre Dame faculty member elected to the prestigious National Academy of Sciences. Craig’s former students occupy prominent positions in universities and laboratories throughout the country. The George B. Craig Memorial Lecture is supported by an endowment established by contributions in his memory, the Department of Biological Sciences and the Eck Institute for Global Health. The work of Craig and other prominent tropical disease researchers in the Department of Biological Sciences laid the foundation for what is now the Eck Institute. Contact: Katherine Taylor, 574-631-1029, ktaylo12@nd.edu.